HAMMAMET, Tunisia (March 27) – Tunisia wrapped up the cadet portion of the African Championships with team titles in freestyle and women’s wrestling and had a wrestler reach the podium in all 19 weight classes. In freestyle, Tunisia won three golds, five silvers, and a bronze medal, finishing the African Championships with 190 points. Their nine medal performance was good enough to finish 39 points ahead of the runner-ups, Algeria, who had a pair of champions and 139 points. South Africa, who had a trio of champions, rounded out the top-three in freestyle with 107 points. In women’s wrestling, the host nation inserted nine of ten wrestlers into gold-medal matches and reached the top of the podium in four of those nine title matches. They also had a third-place finisher, bringing their overall women’s wrestling total medal bout to an impressive ten podium finishes. Tunisia finished the cadet women’s wrestling side of the competition with 215 points. Algeria and Morocco closed out the top-three with 134 and 95 points respectively. The Greco-Roman team title went to Egypt, who blew through the competition, winning seven of nine gold medals. Egypt’s seven gold medals helped them collect 175 points and the team title, 39 points ahead of second place Tunisia. Algeria, who had 110 points, rounded out the top-three cadet Greco-Roman teams. HAMMAMET, Tunisia (March 31) – Tunisia was one of three teams who entered into the final session of wrestling with a quartet of finalists, but their trio of gold medalists helped the host nation hoist the freestyle team trophy on the last day of wrestling in Hammamet’s Omni Sports Hall. Tunisia, who finished with 183 points, had three champions and seven overall medalists who assisted them in narrowly edging Egypt (180 points) by three points for the tournaments top spot. Their trio of champions were Ayoub BARRAJ, Sabri MNASRIYA, and Mohamed SAADAOUI. 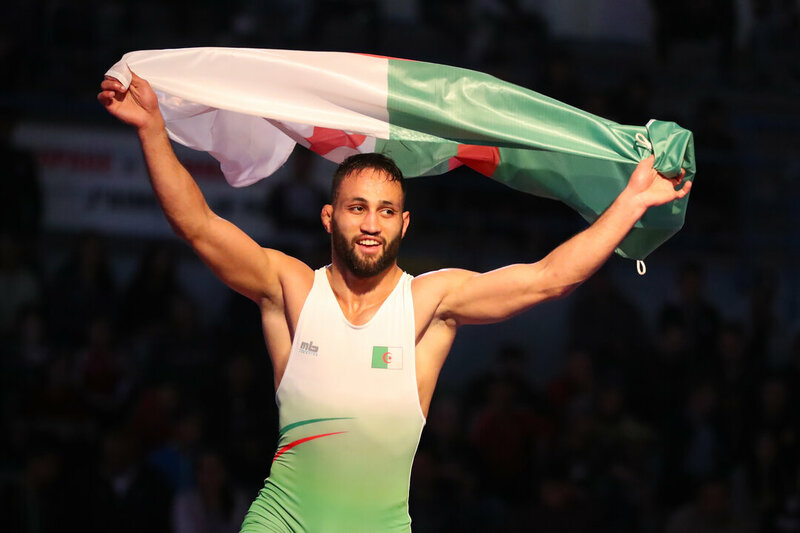 In the 79kg finals, two-time defending champion Ayoub Barraj dismantled Algeria’s Fateh BENFERDJALLAH, 10-0 and won his third consecutive title. Tunisia’s second freestyle title of the day went to Sabri Minasriya who hung on to defeat Oussama REGANI (MAR), 2-1, in the 86kg finals. Their third and final championship performance came at 92kg where Mohamed Saadaoui shutout Egypt’s defending African champion Hosam MERGHANY, 6-0. Egypt finished in second place, thanks to their three champions, Amr HUSSEN, Khaled ELMOATAMADAWI, and Khaled ABDALLA. At 70kg, returning silver medalist Amr Hussen trailed 1-0 after the opening period but ignited for eight second period points before planting 2018 African bronze medalist Fares LAKEL (ALG) on his back for the fall. Elmoatamadawi and Abdalla, the 97kg and 130kg winners respectively, went undefeated in their Nordic system tournaments, claiming Egypt’s second and third freestyle titles. Algeria’s Abdelhak KHERBACHE claimed the 57kg title and helped his nation finishing in third place with 117 points. Kherbache improved on his bronze medal finish a season ago, winning his first continental title with a 3-1 victory over Chakir ANSARI (MAR) in the 57kg gold-medal bout. Morocco, who had 117 points, and Nigeria, who had 90 points, rounded out the top-five of the freestyle team scores. The final three nations who had a solo gold-medal winner were Senegal, Guinea-Bissau, and Nigeria. Senegal’s Adama DIATTA claimed his fifth consecutive African Championship title and tenth overall continental gold medal with a 12-0 thumping of Egypt’s Yasser AHMED in the 61kg finals. In the 65kg finals, Guinea-Bissau’s Mbunde CUMBA MBALI easily claimed the gold medal with an 11-0 routing of Egypt’s Aly ABDELHAMID. Lastly, in the 74kg gold-medal bout, two-time defending champion Ogbonna JOHN (NGR) put together a seven-point second period that went unanswered and won his third consecutive African title with a 7-1 victory over Tunisia’s Maher GHANMI. The African Championships were the first senior-level continental championships of the year. The next continental championships are the European Championships, which begin April 8 in Bucharest, Romania. BRONZE - Gamal Abdelnaser Hanafy MOHAMED (EGY) df. Ebikewenimo WELSON (NGR), via inj. def.